I’m really at a loss with the Academy’s decision here. If anyone in this film should have been nominated for an Oscar for their performance it’s Channing Tatum. And believe you me, I never thought I’d ever say that. But he really gave a career-defining performance, full of depth and a range of emotion I never thought capable of him; add that to a slouching posture and waddling gait and I’d say Tatum really brought the character of Mark Schultz to life. Mark Ruffalo, whom I just absolutely love in everything, didn’t really have enough time to really show us who David Schultz really was. Steve Carell perfected the physicality of John du Pont, but he fluctuated a lot between the character’s voice and his own voice. Also, and the director might be largely to blame for this, but he seemed to really flaunt his prosthetic nose, always turning to a profile when he was the focus of a scene. It was a good performance, but I don’t think I would consider it one of the year’s five best. As far as Sienna Miller goes, I need to see her in a film where she’s playing a woman who’s actually written well and not as a trophy or a tertiary character. That’s what she played in American Sniper and that’s what she plays in this. She has no depth, because neither of the characters were written with depth. It took a long time to get there and then when it finally did it was rushed and came out of nowhere. However, in the real case, prosecutors were evidently unable to find a motive for why John du Pont killed David Schultz, so I don’t think the film is really entirely to blame for it’s lack of explanation. But I feel like the could have built a bit more on John’s “strange behaviour” in the days leading up to the murder. Going back to the acting category, I think Steve Carell could have given a much better performance had he known what John du Pont’s motive really was. All in all, it was a bit muddled, and I wouldn’t say it’s one of the five best original screenplays of the year. 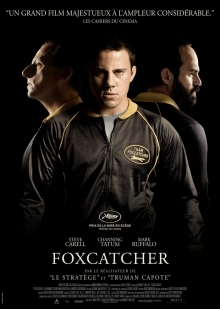 I really loved the production design of the Foxcatcher Estate. However, I don’t really think that the actual footage of the early days of the Estate at the opening of the film were really important to the film itself; they certainly didn’t do anything to further the plot. The musical score had a tragic fragility quality to it, and I thought it accented Mark’s insecurities and self-loathing very nicely. There were times when Steve Carell was overwrought with makeup, and it detracted from the film. Here’s a story that suffered from the inexpert writing. It could have been a lot more intriguing with more adroit hands. There really was no denouement for the story, the film just ended. Again, it took quite a long time to pick up momentum, but then fizzled out at the climax and died. It was a rather lackluster film, to be honest. And lackluster films can’t really be grandiose.